The super successful Indianapolis Cultural Trail has already inspired one project in northeast Denver, and now planners want to create something similar downtown. 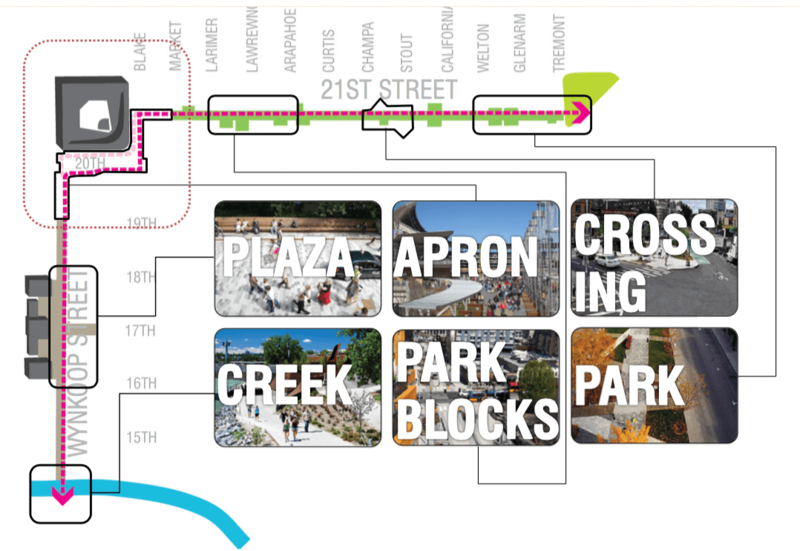 Denver’s Community Planning and Development Department is leading a project that would turn 11 blocks of 21st Street and five blocks of Wynkoop Street into a place tailored for people to walk, bike, and linger in the city center. The Downtown Denver Partnership and the Colorado Rockies are also major players on the project. 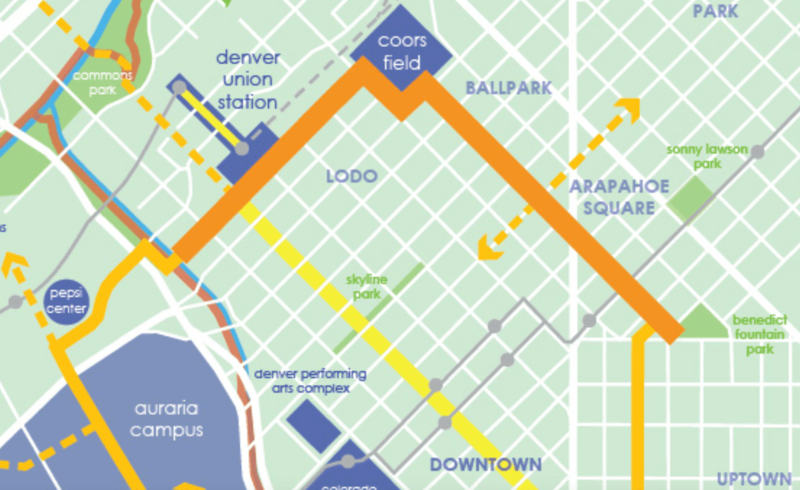 The idea is to weave the route through parks (old and new), local businesses, and major destinations like Coors Field and Union Station, while adding public amenities like sidewalk seating. 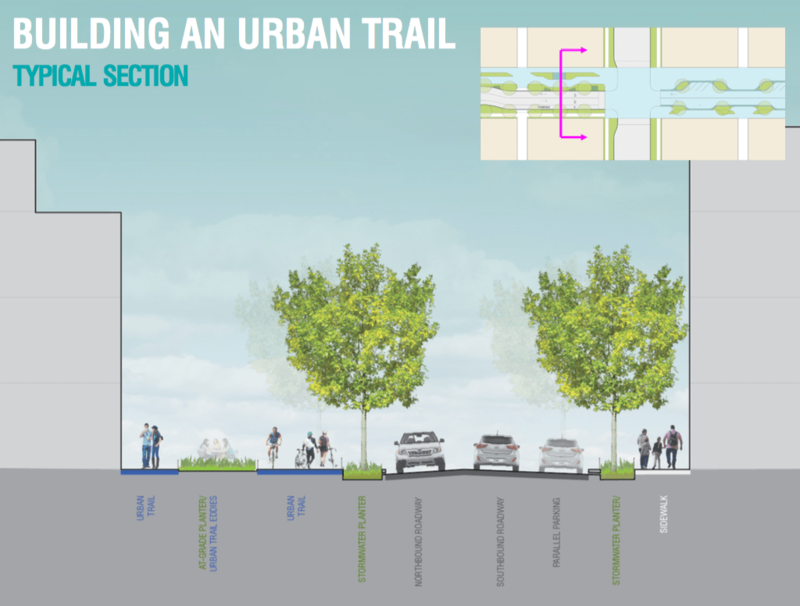 The trail would connect with existing bike lanes and the Cherry Creek Trail, too, to create a loop. 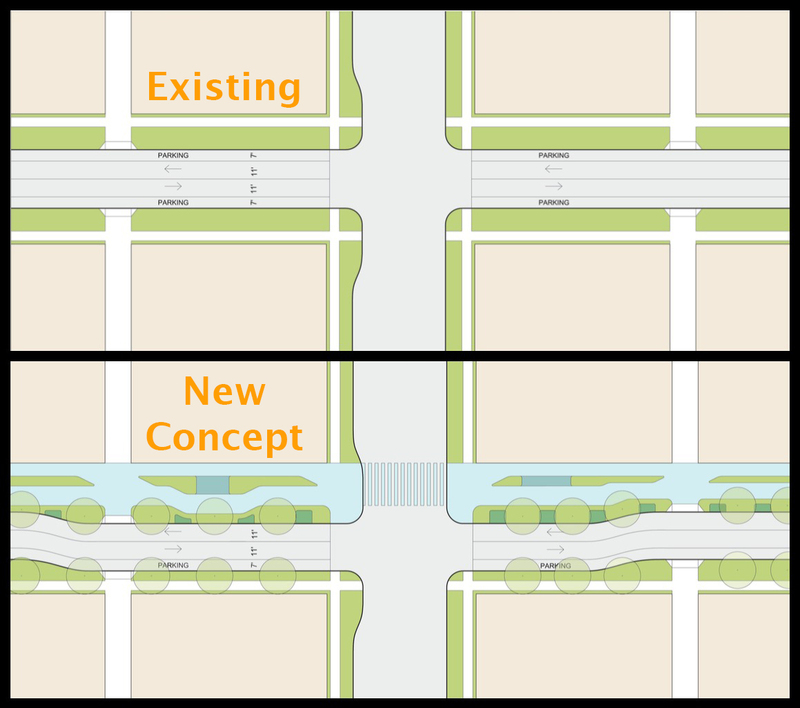 The conceptual plan calls for repurposing parking spaces on one side of 21st to make room for the trail, and adding some slight curves to the street to slow vehicle speeds. While the current design still shows 11-foot motor vehicle lanes, a width that tends to induce fast driving, reps from Aecom, the consultant on the project, said that detail is subject to change. The trail itself would be more than a walking and biking route, with plantings and gathering places interspersed along the way. According to other city plans, 21st Street is intended to become a “neighborhood bikeway,” a street designed to prioritize people on bikes. 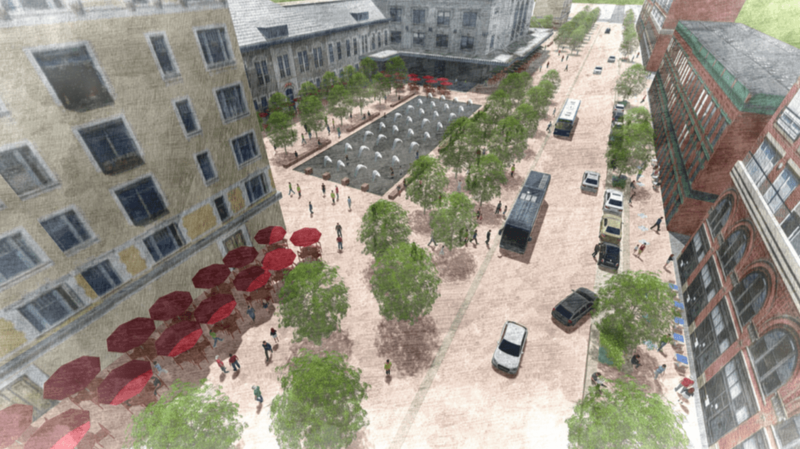 As for Wynkoop Street, planners envision a pretty remarkable transformation. Between the Cherry Creek Trail and Coors field, Wynkoop could become a woonerf — a street shared by people and motor vehicles that sends cues to drivers to proceed very slowly. About 100 people came to the meeting, and feedback was positive overall, save for the occasional concern over eliminating parking spaces. Next, planners will synthesize the public’s comments and begin to look at costs and an implementation strategy. This is great. Although I really believe that 16th Street to 18th Street on Wynkoop should be closed down and become a completely pedestrian area with a bike path only through it. While I agree, good luck convincing the parking garage on Wynkoop between 16th and 17th that. By the way…restriction in bikes….is short sighted. Drop the parallel parking and bump those intersection curbs out more. Cities are defined by hard, urban streets, NOT by soft, grassy trails. This would be far more appropriate outside of the CBD, in the Highlands, RiNo or even Capitol Hill. Denver already has the 16th Street Mall, Skyline Park, Cherry Creek, the Platte and Auraria. If you want a real CITY, you can’t “make everything a park”! Uh mm….so confluence is outside the city? It not in the heart of the CBD – all the stuff around there, now, has been built in the last 20 years – the city grew out there, not the other way around. Hey, I agree, the Highline in NYC is pretty cool. But to put that in context, it is smaller, proportionally, than the space the Cherry Creek Trail occupies, in Denver. Manhattan, all the way from Greewich Village to Harlem is waaaay more urban than this proposal. Paved streets can be very parklike. Look at this scene in Amsterdam. And this view of the Champs Elysees shows that permeable surfaces are certainly an option in cities. Good idea and better that it ‘isn’t’ a major street battling with traffic or pedestrians forcing tense drivers in thick traffic to yield into a bottlenecking love with recreating pedestrains. They would be slow to learn how to be extra cautious for that cohesion. I’ve heard pros and cons from both sides and unity won’t happen over night and not without some idiots not paying enough attention and causing harm to people. Turning Broadway into a bicycle mainline for the probable sake of a ‘look’ in urban cosmetics with pedestrian appeal which realistically will apply gridlock pressure to an already pressured regional/local transit arterial. That pedestrian north/south mainline would function better on Sherman or Bannock, just like this 21st st. would.